Wall sconces are incredibly versatile planters. They can be used indoors or outdoors, as main focal points or decorative accent pieces, to lift shorter plants or beautifully showcase cascading plants. A wall sconce may be one of the smallest plant containers you add to your plantscaping designs, but if used properly it can pay off in large ways. When most people think of installing plant containers, they often forget to incorporate vertical surfaces into their designs. 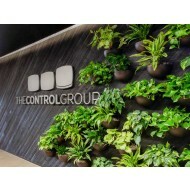 Give your clients a delightful surprise by including wall planters in your designs. Hang them on columns, walls, or posts. Don't forget to add wall sconces to your outdoor landscape projects. While you typically see these planters showcased indoors, some are made of weather resistant material and can be artfully hung outdoors year round. When choosing a wall planter you want to consider its weight. Because of their lighter composition, plastic or resin wall sconces are ideal for this kind of install. You can find plastic pots that are manufactured to mimic other materials such as stone, cement, clay, and more. Wall sconces are a great way to add life to an empty or sterile environment. Hanging plants quickly brighten things up. Just imagine what an impact they will have when the plants burst into a colorful cascade of blossoms.